Holly Berry Cinnamon Wax Bar lets you Immerse yourself in the essence of winter with an ambrosial blend of cassis, clove leaf and juniper berry. 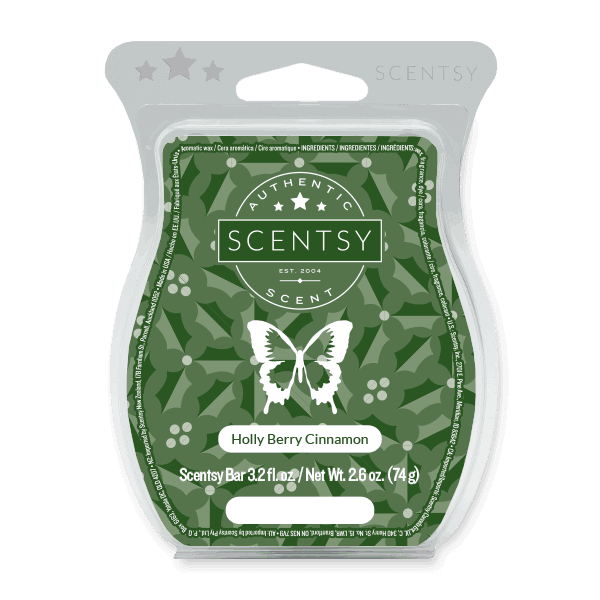 Made of high-quality paraffin wax for long-lasting fragrance, Scentsy Bars are composed of eight break-apart cubes designed to use with any Scentsy Warmer. As the cubes melt, they fill your space with our exclusive scents, inspiring imagination and memories. No wick, flame, smoke or soot. Available in more than 80 fragrances. • Fragrances can be combined to create your own blend. • Fragrance intensity can be increased by adding more wax cubes. • Designed by award-winning perfumers and fragrance designers. • A great value when compared to jarred candles of similar quality. • Multiple fragrance categories offer something for everyone. • Plenty of variety to suit every mood, space and taste.